Kitchen Snaps: Skirt Steak Sandwich with Caramelized Onions & Mushrooms, Arugula and Horseradish Mayonnaise ~ A Complete Dinner for Tonight! 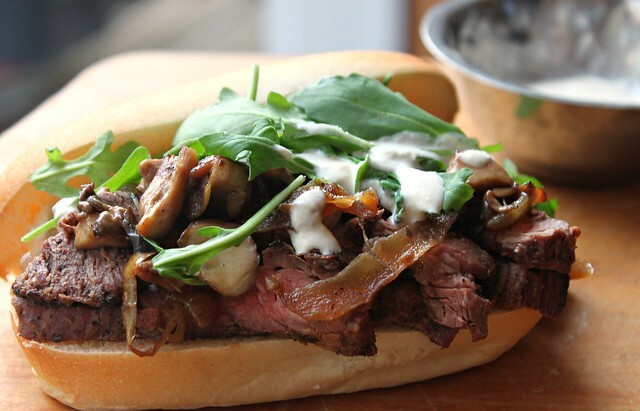 Skirt Steak Sandwich with Caramelized Onions & Mushrooms, Arugula and Horseradish Mayonnaise ~ A Complete Dinner for Tonight! Want to make someone really happy this evening? 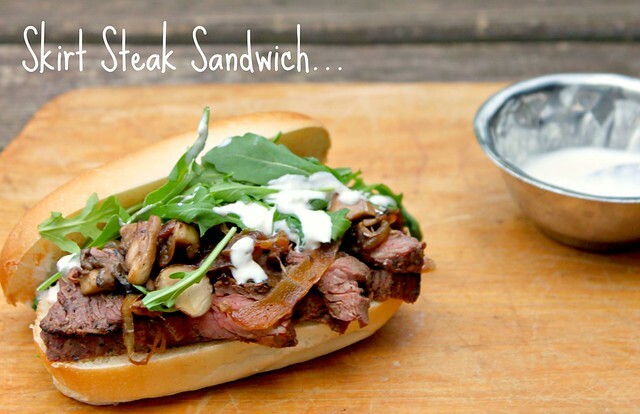 The richness of the skirt steak, caramelized onions and mushrooms ~ pairs perfectly with the spicy horseradish sauce and peppery fresh arugula! Lightly drizzle your skirt steak with olive oil on both side. Lightly sprinkle your skirt steak on both sides with garlic powder, onion powder, kosher salt and fresh cracked pepper. Set aside at room temperature. Meanwhile, place 1-2 tablespoons of butter in a pan over medium-high heat and allow it to melt down, add your onions and cook until soft and translucent, add your mushrooms to the same pan w/the onions and continue cooking about 10 minutes until both the onions and mushrooms are cooked down and caramelized nicely. Turn off heat and set aside. Next, cook your skirt steak on either a super hot grill, grill pan or under the broiler (on both sides) for about 2-2.5 minutes per side for medium-rare. Remove from the heat and allow your skirt steak to sit to retain its juices. Slice your rolls, lightly grill rolls if desired. After about 5-10 minutes of skirt steak rest time, slice your skirt steak on a bias, against the grain. 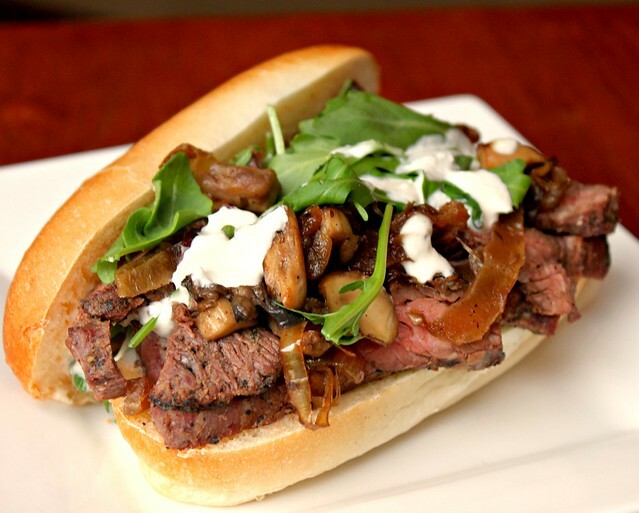 Pile sliced skirt steak on your roll, top with generous amount of caramelized onions and mushrooms, then top with a nice amount of fresh arugula. Drizzle arugula with the prepared horseradish mayonnaise sauce, top with roll and enjoy! YUM YUM.Totally awesome...Thanks for the recipe dear.will try soon.. I'm gonna have to try this one out! Looks amazing! You saved one for me, right??? I'll be right over for lunch, this looks delicious!! Nice job, as always! Your husband knows how lucky he is, right? Skirt steak ... carmelized onions ... mushrooms ... Wow does this sound good! Bookmarked!